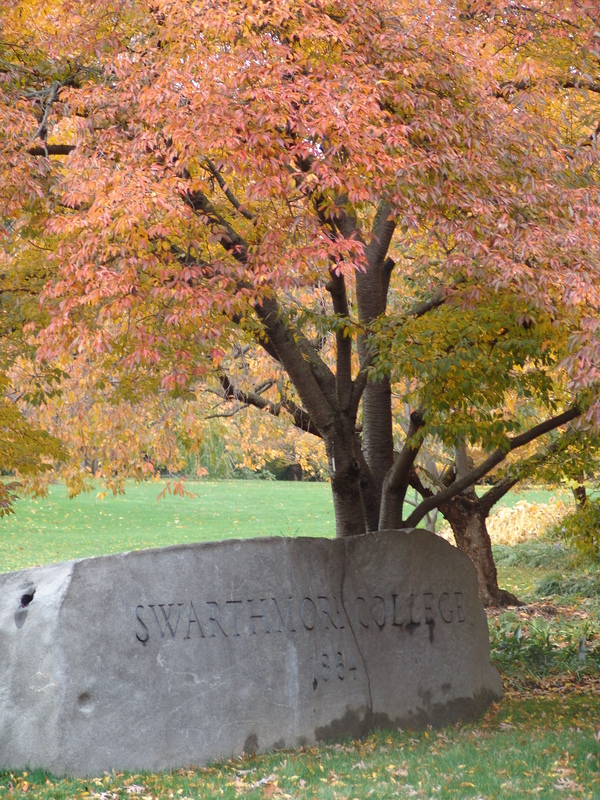 Throughout the fall, the Arboretum receives numerous calls about when is the best time to visit to experience fall color on campus. For the past several weeks, we have been promoting the striking colors of our maple collection along Whittier Place while noting that the rest of campus had not reached peak fall color yet. Cultivars like Acer rubrum ‘October Glory’, Acer saccharum ‘Bonfire’, and Acer rubrum Red Sunset ® have been creating a wonderful preview to the colors of fall. On my drive into work this morning, I was inspired by the yellow and orange tones of Zelkova serrata along Chester Rd./Route 320 and realized fall color has finally enveloped the entire campus. I would like to share some of the best spots to experience the numerous tones of red, orange, yellow, and purples at the Scott Arboretum. I am also posting these images to participate in the Garden Blogger Fall Color Project developed by Dave at The Home Garden. Bloggers are tracking the progression of fall color by posting images and promoting great plants for fall color in your region. 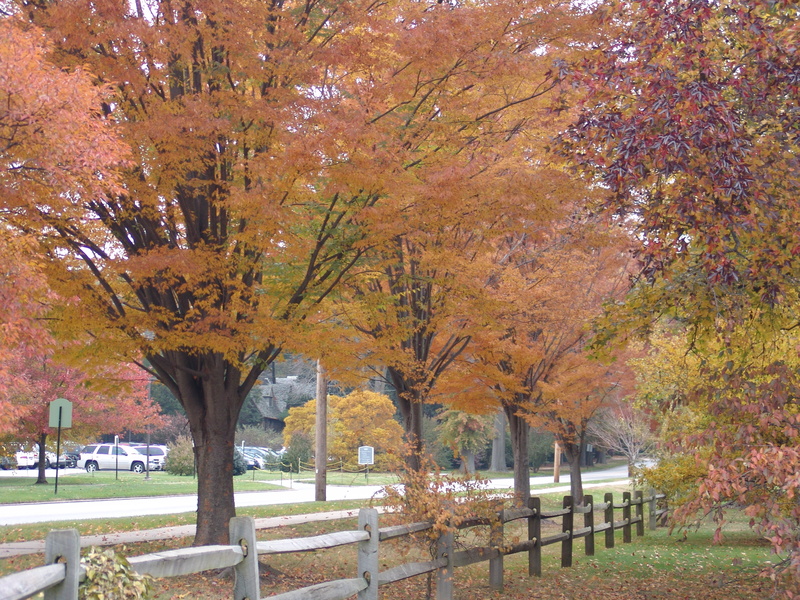 I invite you visit the Scott Arboretum to experience the colors and chill in the air that typifies fall. The next indicator that fall color had descended on campus occurred as I completed my simple morning routine at the Arboretum by sitting down at my computer and looking out my window. Upon taking my seat, I was greeted with a wonderful view of the Cherry Border in dramatic rich tones of oranges and reds. Many remember this part of the Arboretum during its impressive display of blooms in late April, but I find it just as dramatic during the fall. The most striking cultivar in my opinion is Prunus ‘Okame’. P. ‘Okame’ makes an attractive display of orange and yellow fall color at the entrance to the Scott Arboretum parking lot and over the Swarthmore College entrance rock along College Ave.
After taking in this view, I immediately grabbed the camera and marched off to the two gardens on campus that typify fall color for me. The John W. Nason Garden and BioStream both feature a wonderful combination of perennials and woodies with superb fall color and interest. 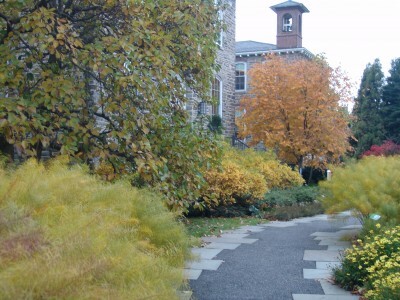 Both gardens are lined with Amsonia hubrichtii. 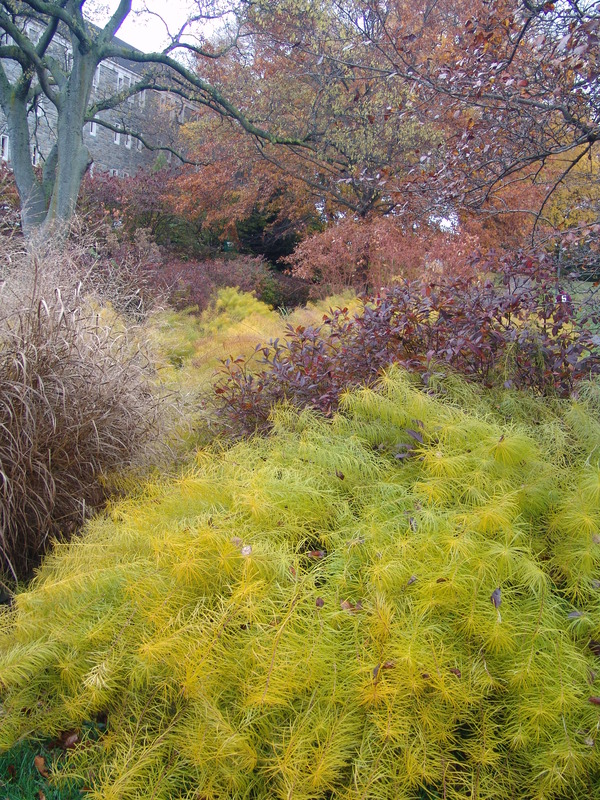 These plantings create an edge along the pathways throughout these gardens that make visitors reach out their hands and run their fingers through the fine, gentle texture of the golden fall color on Amsonia. As you can see from the above photo, the golden colors of Amsonia are offset by the rich red of Itea virginica ‘Henry’s Garnet’ and the tawny brown of Panicum virgatum in the BioStream. In the John W. Nason Garden, the yellow fall color of Clethra alnifolia ‘Ruby Spice’ mirrors the golden yellow of Amsonia with the light orange of Cladrastis kentukea ‘Sweetshade’ as a backdrop. 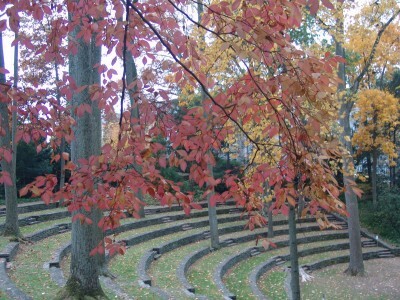 Another must-see region of the Arboretum any time of year but especially during fall is the Scott Outdoor Amphitheater. During the fall, the green canopy created by Liriodendron tulipifera turns a lovely yellow. As these leaves fall, the terraces of the Amphitheater are also carpeted in yellow. This space provides a dramatic view of the Crum Woods which currently is bathed in yellow as well. 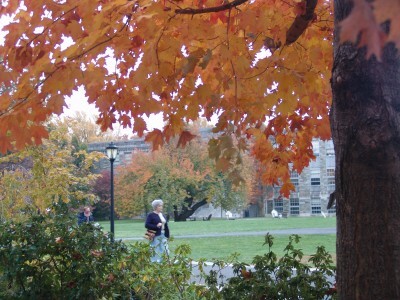 In addition to landscaped spaces, several specimen trees have reached their fall color peak and add to the overall coloration of campus. The red tinted leaves of Stewartia pseudocamellia look striking against the patchwork brown tones of the bark. Cornus florida also presents a lovely red color which appears very dramatic against a backdrop of evergreen rhododendrons and ivy. 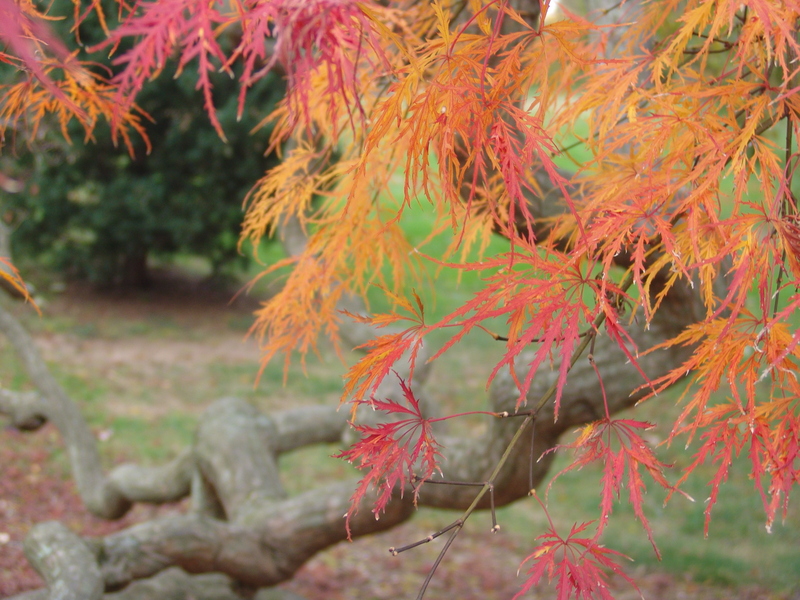 The most vibrant color variation of leaves are found on Acer palmatum ‘Dissectum’ along the path to the Bender Oak sculpture by Marty Long and Faulkner Tennis Courts. This specimen was planted before the Scott Arboretum was established (1929) and the ancient thick twisted limbs are architectural behind the red and orange finely serrated leaves. These are only some of the treasures found at the Scott Arboretum at this time of year. I encourage you to stop by, experience the fall color, and hopefully decide which colors you would like to plant in your home garden. 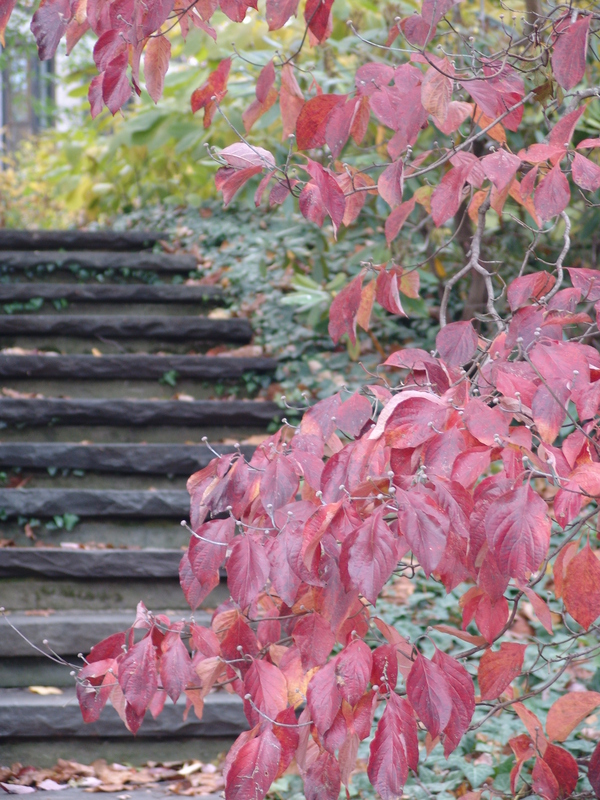 Lets us know which plant exhibits the best fall color in your opinion. Thanks for participating in the project! I just found your blog and will have a post up ASAP. 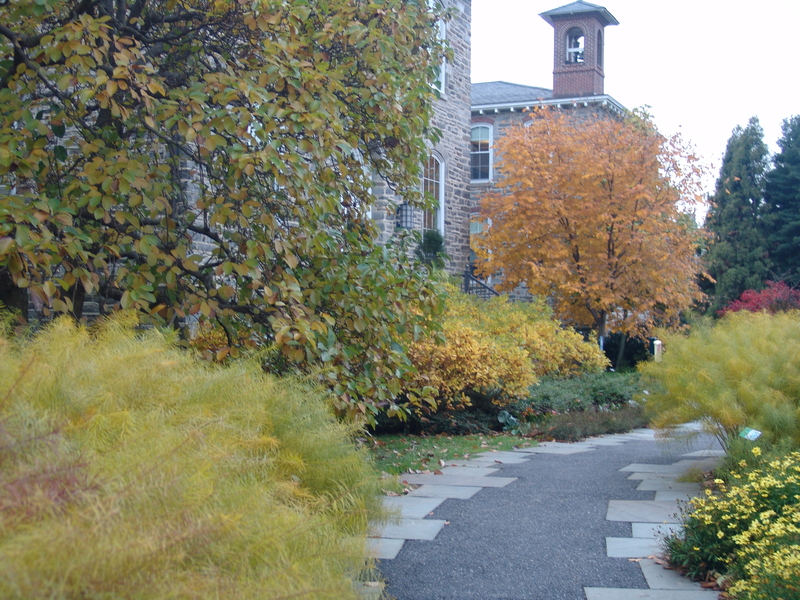 The amsonia plantings are spectacular!